I loved the idea of these fresh rolls and coriander-peanut pesto sounded scrumptious! And, the result? Fresh and yummy! Thanks for your recipe, Sammy! I roasted the peanuts for the pesto as I’m mildly allergic to raw peanuts. I mixed the pesto with the noodle and veggie mixture so I could cram in maximum pesto flavour! 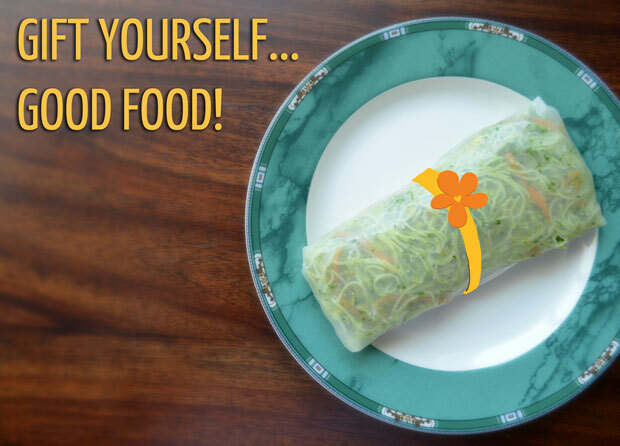 Rolls with pesto, noodles and veggies? Priya, this is my favorite one. Love it! Me too! 🙂 Do head over to Sammy’s blog for more yum stuff! I love these kinds of fresh rolls especially with coriander – it is one of my favorite herbs! Sorry to hear that you had a mild allergy with raw peanuts – what about other raw nuts? Fresh rolls are awesome! 🙂 As for raw nuts, I can’t do walnuts or pecans either. They give me an instant piercing headache – a bit like when you have a big mouthful of ultra cold ice-cream? Ya… tis a shame, I know. Beautiful Pic and one amazing recipe Priya, but availability of rice papers is very erratic here in India. where did u get yours? What a lovely recipe! A beautiful picture too. I know, right. Sammy’s got some great recipes! This is beautiful:). Is this your picture Priya? It is so cute.